I've been away from the community for a while.. and looking around the blogs, github commits, etc. not much has changed. What's the state of the Leaf? I remember a few months ago there was a lot of work being done on libmaple/wirish, new hardware being designed, etc. What's new and exciting? How's the progress on the USB/Bootloader changes? Is the Native still in Beta? Oak, what's that? LOL! I've heard STM32 released some new chips, thoughts? Do aliens exist? Aliens *might* exist, but I cant confirm whether or not we have been busy reverse engineering their technology. Sorry for our recently thin presence on the forums, we have been very busy on all sorts of fun things! Partially client work, but also a ton of product work too. We kicked off the Maple II design effort recently, and we should have prototypes pretty soon. We are moving to the STM32F4 - 163MHz, with a floating point unit, high speed camera port, and oodles of other cool stuff. As it turns out, the stm32f2 and f4 chips have radically different peripheral interfaces than the stm32f1, like we use on Maple. So a lot of work has been going into bringing libmaple up to support stm32f4! Oak is finally starting to hum, the latest prototype has the MCU talking to the FPGA over the memory interface even faster than the Maple Native can. Dont quote me, but I think we might get as much as 32MB/s throughput between the FPGA and the MCU. Maple Native and Oak will most likely get face lifts to the stm32f4, which is an annoying but worthy source of delay. On the IDE side, we are working with the Wiring team to build a unified IDE that supports a number of different boards. More details on that project forthcoming, but I am really looking forward to better windows installation experience, smarter compiling, multi-vendor board support in one IDE, and a smarter preprocessor. Out of left field, there are some very cool audio projects being done with the audio codec shield (openmusiclabs.com). Hopefully the developer will get a blog post up about this soon, but from what Ive seen its all I can do not to build a productized maple-based re-programmable guitar pedal. It looks like all you users have been up to a lot around here, awesome! I missed this email but there are very interesting stuff in it !!!!! Is it possible to have more info about the STM32F4 "maple 2" ? Is there a "maple mini 2" in your plan ? I know the STM32F4 does not come in 48 pins package but i wondered if the 64 bits one would fit on the mini layout ? If not, the chip could be a bit outside the current layout! P.S. If anyone is interested I can share design in Eagle format. The board is single sided, but quite dense, so reproducing it at home might be complicated. siy, it would be very interesting to look at your design. Yes, single side. I've not set up through plating process at home yet, so wast majority of my PCBs are single sided :) But, as I mentioned above, the board is quite dense - 0.15mm/0.15mm traces/spaces. Send me a message to sergiy.yevtushenko at gmail dot com and I'll send you design files once I'll be at home. FYI - I am working on a double-sided breadboard-friendly PCB for 64pin LQFP packages with similar dimensions. I am using the least dense track/space I can, which is 10mil/10mil (0.254mm/0.254mm) except for the actual MCU pins which are on a 0.25mm/0.25mm pitch which gives closer to a 10mil/9mil track/space. I am using this coarse pitch because I am trying to enable DIY-ing the PCB. I don't use plated through holes. So I try to keep the vias to a minimum (less than 30), and the vias are made with bits of solid wire, and hence there are no vias under components. I still need to do the STM32F1 to STM32F2/4 changes. I'm also making prototype boards at home (including board mentioned above). The 0.15mm/0.15mm track/space is definitely reachable, although this is not very simple process (I'm still tuning it to make it more stable). Reaching 0.2mm/0.2mm is a routine task (I know many peoples who reached this limit) with photoresist and average laser printer with 600dpi. No expensive equipment is required - most expensive part related to PCBs in my home lab is Dremel MultiPro installed at Dremel WorkStation and set of good drill bits :). Adding a solder mask is also very simple (in fact it much simpler than making PCB itself). I've not tried adding silk screen yet, but going to try it once I'll finish tuning PCB process. I guess that discussion of the DIY PCB processes is off topic at LeafLabs forum. If not, we can discuss it here (probably in separate topic). If yes, you can contact me via mentioned above e-mail and I'll share my experience with photoresist technology. I am interested to hear your experience. I am deliberately trying to use common hardware, hence using the 300dpi laser printer. Pretty much every UK school and public library has that or better. I have tried an industrial-grade 1200dpi HP laser, and got shockingly sharp results on a test pattern, so I am confident 6mil/6mil is practical (i.e. 0.15/0.15). But that isn't the point. Higher quality printers are less interesting to me because fewer people have access to them. I am experimenting to understand how to design boards that are makable for lots of people, especially school children. Another constraint is I use quite large diameter vias because thin drills are delicate and need lots of skill and care to use. I try to use larger SMD components to make it easier for people to assemble the board. All SMD parts are on one side, so it is okay to use a toaster oven. Etc. Having said all that. we are using a double sided UV box, which *is* rare. So I am very interested in your approach to making single-sided PCBs. I am very interested in the electrical properties of the resulting PCB. I am concerned that the noise properties of a single sided PCB are very poor, but I am very willing to be educated on this. OK, I understand your considerations and (I hope) goal. Below are my thoughts on this. Of course, they not necessarily correct, but they reflect my experience. I think that most common resolution these days is 600x600dpi, while some printers have 1200x600 or even 1200x1200dpi. Even cheapest (under $100) printers have 600x600dpi. I did a quick search through local stores and was unable to find 300dpi printers, I'm even not sure that they are even produced these days. So, if you're targeting common and reachable equipment, assumption about printer resolution should be reconsidered. With 600x600dpi printer 0.2mm/0.2mm (8mil/8mil) traces/spaces are easily reachable. Printers with hardware resolution 1200x1200dpi are not so expensive or rare as well, for example Samsung ML-2851ND is about $230 in local stores. In fact reaching high density is constrained not by printer resolution, but by the remaining parts of process, in particular etching. The photoresist process is highly sensitive to tight and close contact between mask and photoresist. Since for double sided DIY PCB at least a couple of drills are required match sides, they must be of high quality, i.e. edges of the drill must be clean and copper around drill must not be jammed. Copper jamming is also an issue for vias and pads, because during soldering jammed pads/vias often fall off. Unfortunately copper jamming with regular drill bits is almost unavoidable. In other words, carbide drill bits and drill press is a requirement for more or less dense PCBs (0.25/0.25 fits into this category too). With drill press 0.4-0.6mm drills are very simple to make and appropriate drill bits are easy to obtain. Taking this into account, I see no reasons for large vias constraint. The ST32 MCU in 64-pin LQFP package is not the simplest component to solder. I think that peoples which can solder it can easily solder 0603 or 0805 resistors and capacitors. This is advanced process and it allows to reach quite high density. But it is not the simplest process for home lab and requires some experimenting for adjusting to particular environment (UV lamp, chosen developer and etching solution). Another issue which complicates use of photoresist technology is a requirement for photomask density. Average printer produces image which is black for eyes, but it is half-transparent of you look through image on light source. Toner saving modes as well as various resolution enhancement technologies also targeted to human eyes, but UV lamp is not human eye and resulting mask is not acceptable. This is solved by disabling toner saving/resolution enhancement during printing and postprocessing the mask with toner density liquid. In other words, preparing mask is another (and not very simple) process. So, if PCB production simplicity is a requirement, then probably it worth to consider other process, for example some kind of press-n-reel. I've not measured electrical properties of PCB, but I saw no stability problems with my boards. All designs are done with large GND poligon which covers all available space and power traces are wide enough. Also, I'm trying to follow ST layout guidelines as close as possible and every VCC pin has capacitor placed as close as possible to it. Main guidelines which I'm trying to follow: single GND polygon which covers entire board and wide power traces and traces which should hold significant current. In cases when air routes are unavoidable, I'm using 0-Ohm SMD resistors to jump over one or more traces. The design mentioned above uses one 1206 resistor for this purpose. Also, this board is quite dense just because I've tried to achieve three contradicting goals - keep distance between pin headers equal to 1.2"; made distance between inner pin headers as large as possible (and still compliant to 0.1" step); make board as small as possible. These not easy to achieve even for double sided PCBs, so I'm really happy that I was able to keep board single sided. Relaxing these requirements (for example, using 1.4" distance for pin headers and make board slightly longer) significantly reduces the density. In fact few of previous versions of this design were done with 0.2/0.2 process. I think it can be relaxed even further, I just didn't tried that because had no need to relax density. If you're interested I may try to do this and send resulting design to you. Of course, to do this I need to know the requirements - pin header distance and target traces/spaces width. siy - thanks for feedback. I think our target users and goals are very different. Unfortunately, my colleague's employer has decided to force all of their network of laser printers to 300dpi. Some are 600dpi or 1200dpi according to manuals, but it really doesn't seem to matter. They act as 300dpi to our test patterns. It seems to be a function of their network printing software, and we haven't found a way to override it. I also feel that for the boards I am currently doing 10mil/10mil is fine. After the footprint 'tweaks' 300dpi seems to be good enough. I try to avoid finer tracks in case a board needs to be reworked, when a thicker track is a bit more robust. I know some colleagues who aim for very wider tracks, i.e. 1mm or more, wherever possible! People new to soldering tend to hold the iron on too long and 'lift' pads and tracks. We like photo-resist a lot. We are aiming at schools and not the home lab. Many schools seem to have UV exposure systems. We feel we get very nice results, and have been through the learning process to get those results. We think they are consistent too, so we can make multiple, identical, double-sided boards. In the few experiments, student-made boards seemed pretty-good too. Clearly, single sided photo-resist could give superb results, and still be pretty straightforward for schools. So far, we have not put any holes in the boards to get alignment between sides. We make a 'pocket' of the two masks, and expose both sides simultaneously. Another colleague has used holes to align the masks when he uses a single sided UV box. He says he has regularly achieved 0.25mm alignment with some practice, but we haven't done that experiment yet. A new UV box will need a bit of testing to calibrate it, but once the exposure time is known, they seem to be consistent for a while. Now we find a hatched fill, proper photo-mask film, and cleanliness overcomes most problems in the printing, exposure and etching chain. We did try ordinary film for weeks, but got patchy, inconsistent results. Then we were introduced to 'proper' PCB film, and instantly got much denser black and sharper edges. We don't post process the film. Since we switched to 'proper' film, use the right printer settings, and hatched fill, we get good masks (at 10mil/10mil) and PCBs. Etching - yes, etching constrains resolution more than high resolution printers, so does cleanliness. Our experience with photo-resist technology is a spec of dirt during exposure is much more of a problem than almost anything else. We started with ferric chloride, but that gave very poor results compared to 'clear' etchant, which we now use exclusively. press-n-peel - I don't feel confident that I could get the two sides aligned. With photo-masks, side to side alignment is better than 0.2mm with a double sided UV box (based on microscope examination with a fine steel rule showing 0.5mm divisions). We need to do experiments with single sided UV exposure. One idea is to use 'press-in' 'plate through' 'tubes' to get alignment. Another friend, who is a technician at a college, has a nifty little CNC mill that is very popular in UK schools. I intend to do some experiments with that to drill our etched boards. He showed me how to mill and drill PCB's using the CNC mill. My young colleague Stephen has got very good at this for single sided boards. Stephen has made his own sensor boards, and motor controllers for his championship-winning robots (he is 16yo). PCB milling is a nice process for schools, but it takes some skill to set up. Resolution is only moderate, but good enough for some stuff. SMD parts - IMHO 64pin LQFP in a toaster oven isn't as bad as 0603. It is almost the last part to be placed (the way I do it), and is the only one, so I find it less stressful or tiring than placing twenty 0603's. I use 0805 or 1206 SMD parts (or bigger) as much as practical. My colleague is experimenting with making cheap solder-paste stencils. We currently apply solder paste with a very fine syringe. This is quite slow, and skillfull. 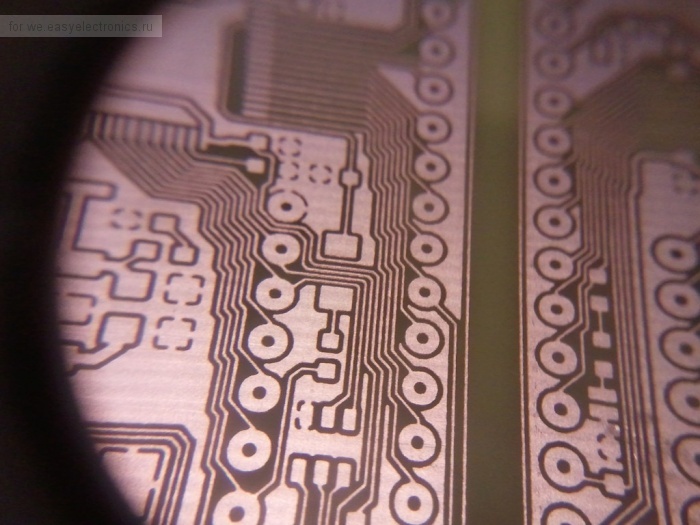 If he can crack solder-paste stencils, we think kids will be able to make boards more easily. Paul Gardiner (a local Electronics teacher and consultant) has been using solder paste, SMD and a toaster oven, for most of his 12yo to 16yo pupils for a couple of years, and he finds kids get very good at it, much better results than soldering with an iron, quicker, and finer. Noise - how many bits of an ADC input are stable when it is tied to ground (or Vcc)? When continuously sampling the ADC, and concurrently doing other things, is the 'noise' on the ADC effected? For example, if the program briefly 'flashes' an LED, on a nearby digital output pin during an ADC sample, does that effect the ADC reading? If you put an oscilloscope on digital input pins next to the 'flashing' LED, does the digital input bounce around? siy - I am with you on the advantages of single sided. It would be much easier to make the PCB. It might even be possible to mill 0.25mm/0.25mm with a nice sharp engraving tool, on a good quality school CNC mill, but the cheaper mills can't achieve that; 0.4mm/0.4mm is doable though. My existing double-sided board is 1.2" pitch, on 10mil/10mil track/space, 0805 or bigger parts, ground and power polygons top and ground polygons bottom, 'almost-isolated' ground under MCU, with 30-60mil power traces (I think). Distributed decoupling capacitors on power pins, ST PCB guidelines (e,g, for crystal), etc. No need for you to do anything. I will stare at my design for a few hours to see how I could rework it to single sided. That analysis might improve it anyway. I think, on my board, routing the USB signals is not simple on a single side, but the rest is not too bad. Unless single sided measures well, I'll likely use double sided boards. I believe double sided significantly improves EM noise, and certainly makes power distribution easier.